The public is invited to a goodbye reception for Chancellor John Pugh in honor of his retirement on Saturday, May 30, 2015, from 4:30-7:30pm at the Lakeside Grill in the Mourant Building, UAS Juneau campus. Music by Tom Locher and friends and refreshments will be provided. Attendees are invited to thank Pugh by sharing memories and stories from his 28-year career at UAS that began as a Dean in 1987. He was appointed Chancellor in 1999. In some ways, Pugh said in recent remarks to staff, UAS has come full circle. “When then-Chancellor Marshall Lind hired me in 1987, oil prices were down to 8 dollars a barrel. 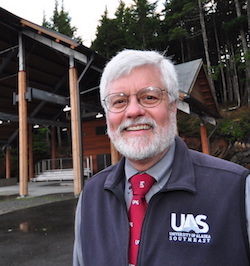 I was asked to cut 1 million dollars from a $12 million budget.” Pugh recalled how despite tight funding over the years, the UAS administration found ways to build a recreation facility, create a development and alumni office and build a freshman residence hall on the Juneau campus. Provost Rick Caulfield will start work as Chancellor June 1. Caulfield was selected to replace Pugh by UA President Pat Gamble after a months-long national search. Pugh announced last October he would retire at the end of May. “Rick’s done a good job as Provost and will do a good job as Chancellor,” Pugh said. “I am pleased that we have someone in place for this important transition with experience in higher education in Alaska.” He added that Caulfield’s leading academic programs over the past five years as Provost will serve the institution well as it moves into challenging budget times. Caulfield completed undergraduate degrees at the University of California Berkeley, a master’s degree at the University of Alaska Fairbanks, and his doctorate in the United Kingdom. He has worked in the University of Alaska system for more than 30 years, including as provost, dean, campus director, and tenured full professor.